If life out on the road wasn't hard enough, you have to constantly worry about being captured by war parties. And it's not like they'll even do you the justice of killing you... no, they'd much rather keep you alive for blood and spare body parts. (You are a universal donor after all.) To top it all off they're going to put a mask on you just like this one! If you'd rather just spend a night in costume than being walking organ donor, we suggest rocking this face guard mask with your favorite leather jacket. You'll have an authentic post apocalyptic look with out having to deal with any maniacs! 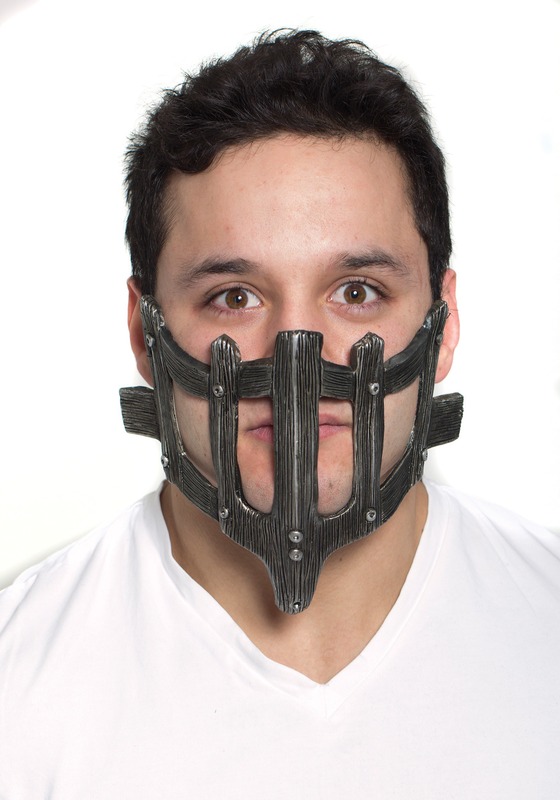 A molded vinyl face mask fits around your head with an elastic band. Textured ridges and faux rivets are painted to make this prop look like it was made in some sort of cultist's insane shop. You can rest easy when you add this mask to your costume, because with the simple fitting band, you're not going to need a heavy duty file to take it off at the end of the night! Flexible and easy to wear. Was a big hit at a company party.